From 3 Nov 2014, as part of the project "Improvement of health care of the elderly, dependent and chronically ill people from Żary and Lubsko and the rest of the southern area of the Lubuskie province" activation of senior was started, through treatment with movement. The goal is to improve physical fitness through indoor and outdoor training. As part of the activation process, the senior are accustomed with exercises that help them in everyday functioning, improve their mood and will motivate them to pursue and active lifestyle. 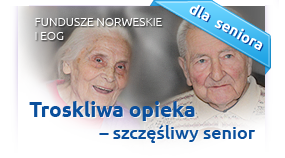 We invite seniors to attend free classes that take place twice a week, on Tuesdays and Thursdays from 3 p.m. to 4:30 p.m. in the classroom in 2 Poznańska St. in Lubsk (1st floor of the hospital - Health Care Centre). The training is conducted by the qualified Szpital Na Wyspie personnel. Participation is completely free of charge. We ask the participants to bring rubber-soled shoes, clothes not hindering moves, drinking water and good mood.